The future of the Scottish Open has been secured until 2020 thanks to extended commitments from the title sponsor and Scottish Government. The government has pledged £1m per year, while Aberdeen Asset Management will continue to back the tournament. The announcement adds three further years to both parties' contracts. It was also revealed that the prize fund will increase to a minimum of £4m in 2018, with this year's total standing at £3m. 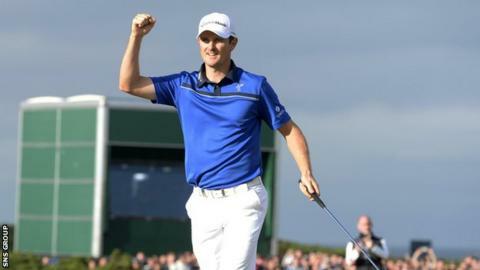 Justin Rose won at Royal Aberdeen in July, with the event, always staged the week before the Open, moving to East Lothian's Gullane Golf Club next year. Castle Stuart Links near Inverness, the scene of Phil Mickelson's 2013 triumph, will be the 2016 venue. European Tour chief executive George O'Grady, who confirmed on Wednesday that he will step down once his successor is found, said: "Naturally, we are delighted at the extended commitment of both the Scottish Government - our longest partner in Scotland - and Aberdeen Asset Management to the Scottish Open. "This is wonderful news, not only for the tournament but for the European Tour as a whole."